John Wesley on Spiritous Liquors? 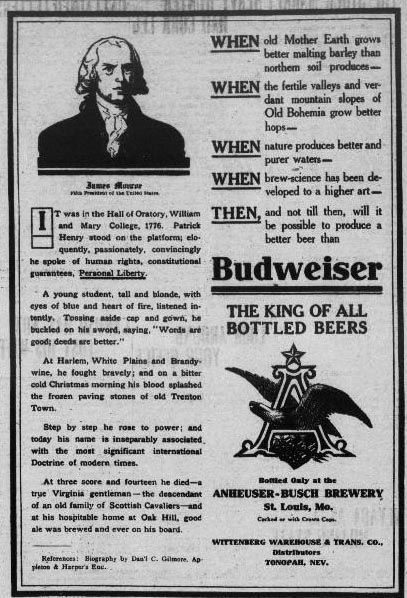 John Wesley Budweiser Beer Ad? This post is the result of coming across a Budweiser Beer advertisement. 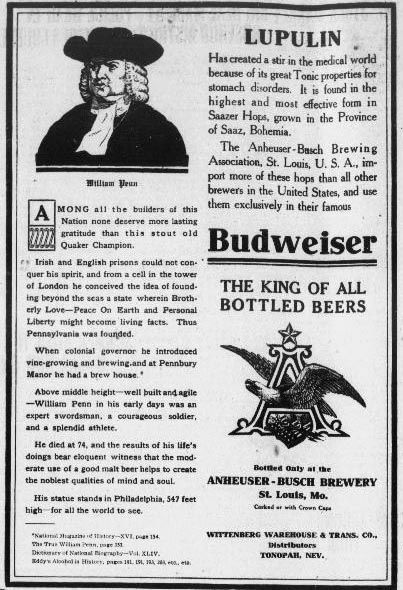 In this advertisement for Budweiser, John Wesley, the 18th-century, founder of the Methodist religion was portrayed as an advocate of beer drinking. 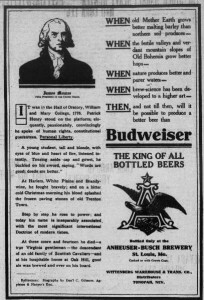 This John Wesley Budweiser Beer ad was run nationally, during the summer of 1908. 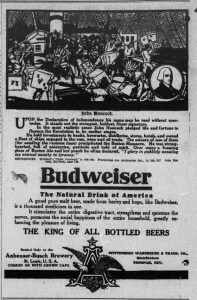 The John Wesley Budweiser Beer ad pictured is from Nevada’s Tonopah Daily Bonanza which ran from 1906 to 1929. At first reading, I was somewhat confused. Why was this advertisement mentioning John Wesley? Was it a reflection of a more religious time in America’s history, one where they honored those who clearly influenced the successful founding of this great nation? Or was it something else? 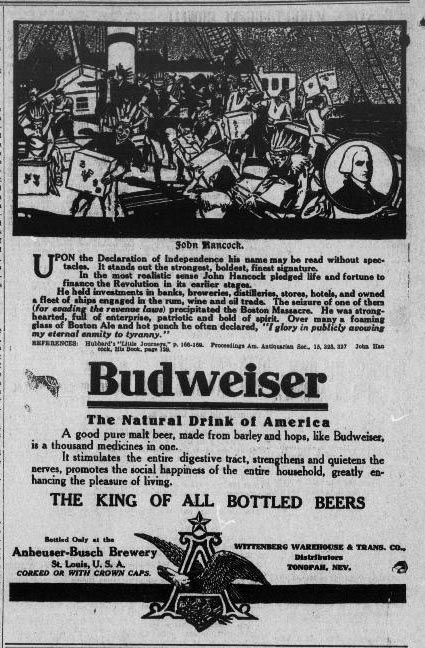 It soon dawned on me that the timing of the John Wesley Budweiser Beer ad occurred in the heart of the American Temperance Movement that was painstakingly attempting to outlaw spirituous liquors in the United States. 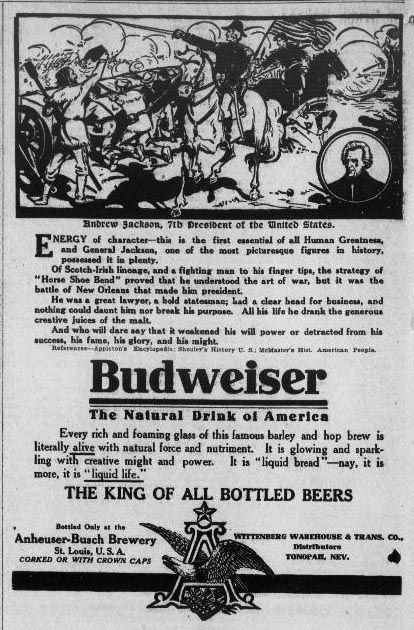 The thought began to sink that Budweiser was attempting to battle the growing movement that was attempting to end the sale of liquor, beer and wine in the United States. Section 1. After one year from the ratification of this article the manufacture, sale, or transportation of intoxicating liquors within, the importation thereof into, or the exportation thereof from he United States and all territory subject to the jurisdiction thereof for beverage purposes is hereby prohibited. 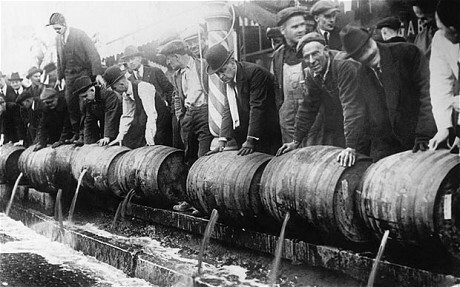 Thirteen months later on January 16, 1919, the Eighteenth Amendment was ratified. 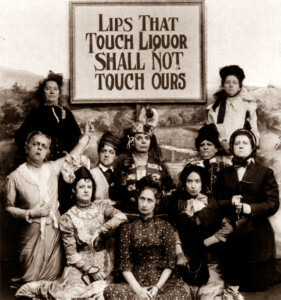 The Temperance movement was originally started by women who with their children, suffered as a result of men in their lives who abused the consumption of intoxicating liquors. 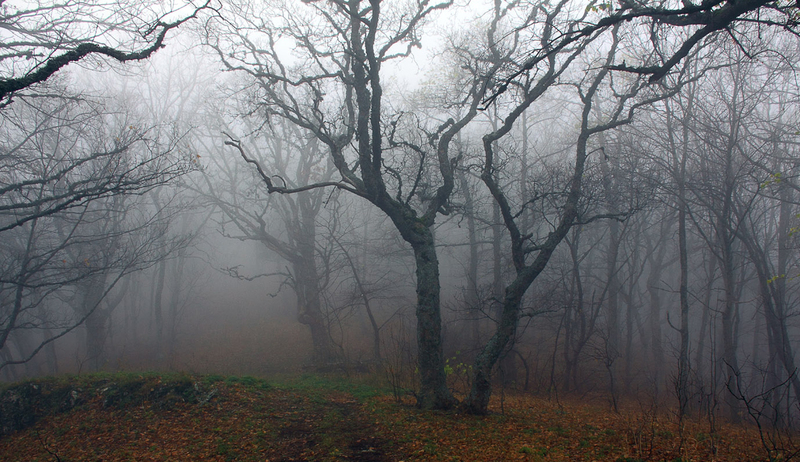 Their initial efforts focused on the return of moderation. Eventually, this movement morphed into pushing for complete abstinence. 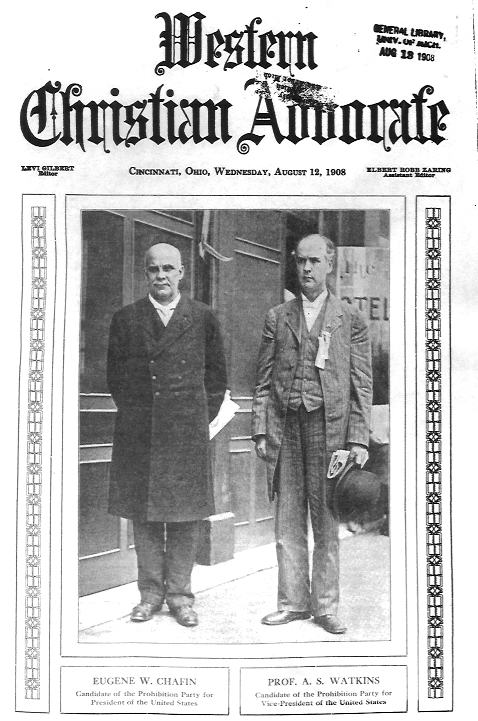 The movement’s main focus also dovetailed with America’s strong Christian faith which permeated much of the culture. The warnings of the Bible, coupled with the evidence of real life tragedies powered the outspoken men and women of this movement. 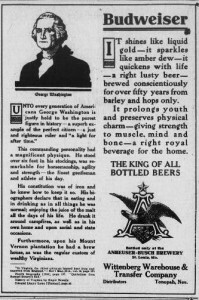 Uniquely, many business owners of the day were also part of this movement, they too had experienced real-life tragedies in lost productivity from their workers who were either drunk on the job or too intoxicated to show up for work. Adding to the proliferation of alcoholic abuse was that at this time in American history, intoxicating drink was cheaper to purchase than clean water. Long before the American Temperance movement, the yearning to curve the abusive consumption began in Europe when in the 1820’s the movement moved through Ireland, Scotland, and Great Britain. Fifty years before, much of Great Britain was finally making progress away from the rampant addiction to Gin. Much of this success attributed to the brave efforts of John Wesley from the 1740’s to the 1780’s. About the same time as the Irish and Scottish movement, another branch of this effort materialized in Sweden and Norway, eventually making it to the shores of America. In America, the first state to pass a law against the consumption of intoxicating drink was Maine. On June 2, 1851, the state of Maine passed this law which soon became the role model legislation for other states of the union. Two notable women who promoted the Temperance Movement were Susan B. Anthony, the matriarch of women’s rights and Carry A. Nation, a strong supporter of Prohibition, women’s suffrage and women’s rights. She had lost her first husband, the father of her first child, to death by alcohol abuse. 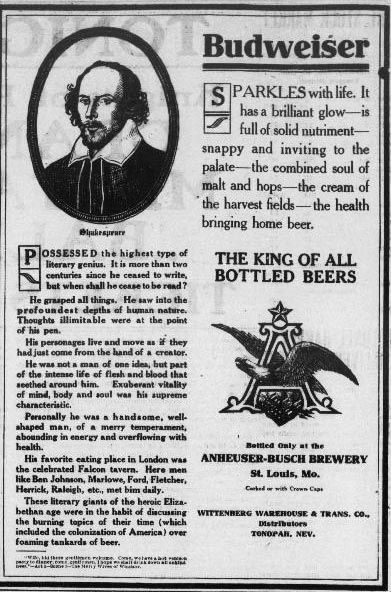 It will be noted that the brewers’ advertiser can not even quote honestly, since he omitted the significant words ‘or something answerable to it,’ thus adding to the dishonesty of his attempt to foist upon John Wesley the utterance of an altogether other person. By the term ‘fermented liquor’ the brewer evidently intended that we should understand beer, a total misrepresentation, as we shall see. At the fullest value which can be attributed to the passage, Mr. Wesley meant nothing more than to say that he believed wine to have a medical value. What he thought of wine-drinking we shall see later. As we shall see, this is a gross misrepresentation. 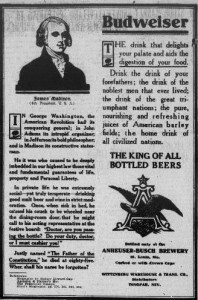 It is interesting to inquire what Mr. Wesley might have meant by ‘small beer,’ since the term is now almost wholly unknown except in a figurative expression of common use to indicate contempt for some person or thing. The ‘small beer’ of Mr. Wesley’s day was beer of very light alcoholic content, commonly a home-made brew which was not suspected of intoxicating properties. Mr. Wesley would doubtless have been shocked at the idea of recommending to any one the use of an intoxicant. The transposition of the ‘only’ and the other changes in the sentence mean nothing other than deliberate fraud. What of John Wesley’s personal habits? Considering that the arguments made above in The Western Christian Advocate clearly point away from the accuracy of the John Wesley Budweiser Beer ad, is there anything in the personal life and habits of John Wesley that would lend credence to Budweiser’s attempt to link beer with John Wesley? 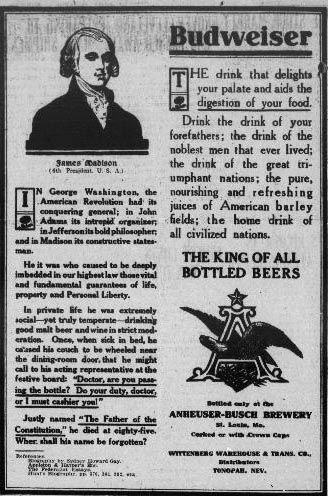 As expected, there is no valid indication to show that John Wesley would have approved of being on an advertisement for beer. In John Wesley’s day, total abstinence was virtually unheard of, yet that is exactly how John Wesley lived. 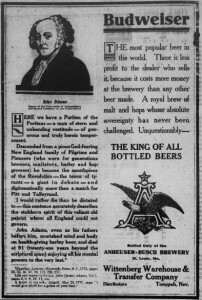 John Wesley’s writings do indicate that there was a period where he partook of wine, but that this was on his return from America in an attempt to remedy a medical condition. His writings indicate that he soon left off wine and quickly gained better health. Interestingly, in 1773, Great Britain was suffering a shortage of grain. This shortage of grain led to a shortage of bread, which, led to several bread riots within the nation. John Wesley placed the blame for this shortage of grain solely on the destruction of grain that was used to make liquor. 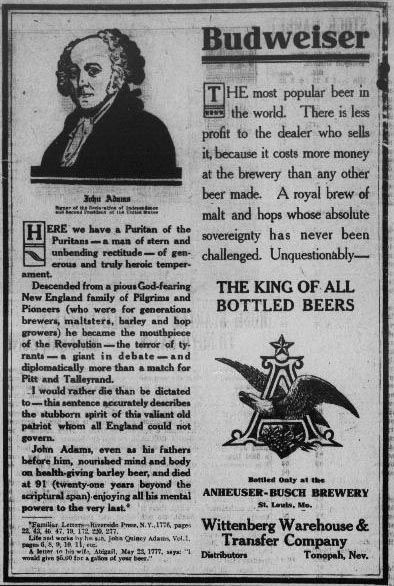 “The attempt to use this morning star of Prohibition as an advertisement for a beer saloon is an outrage that ought to bring down upon the lying brewers who perpetrated it the vengeance of every Methodist, every Christian, every honest man- at the ballot box.” These words seemed to have resonated on the listening nation as Americans successfully fought and won the prohibition of intoxicating liquors. Unfortunately for them, these efforts were short-lived. Fourteen years later in 1933, the Twenty-first Constitutional Amendment repealed the Prohibition of the Eighteenth Constitutional Amendment. To be honest, I did not spend time researching the Prohibition Political party, however, I did come across this photo of the candidates for President and Vice-President for the official, Prohibition Party. 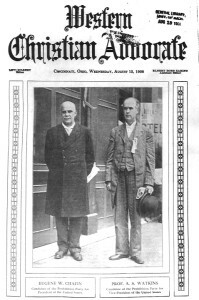 At some point in the political process, the men obviously lost to William Howard Taft and James S. Sherman, the men who took office as president and vice-president in 1909. 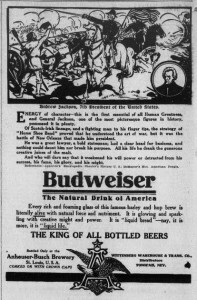 It seems that the Anheuser-Busch campaign to fight the growing public sentiment for prohibition produced several other Budweiser Beer advertisements. 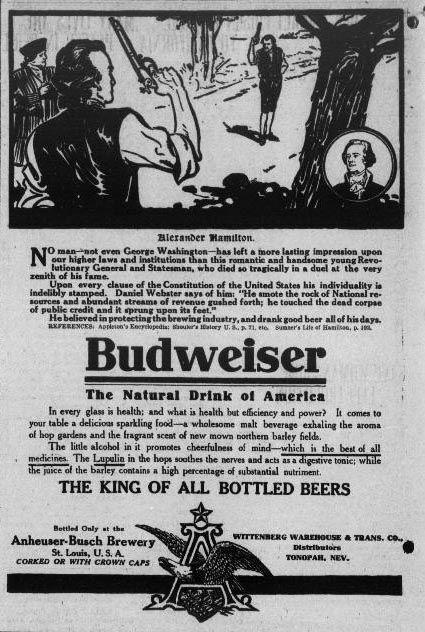 But none of these were as controversial as the John Wesley Budweiser Beer ad. 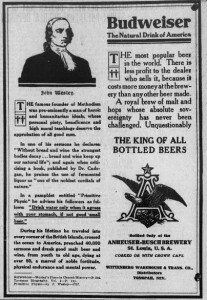 Below are several of the advertisements. Enjoy this opportunity to look back in time. These all appeared in the Tonopah Daily Bonanza.